I am getting back into cooking after having given it up for several years. My daughter is a wonderful cook and liked doing it, and it is only after her move out that I have taken back this dreaded task, though I must admit that I learned a lot from this period of watching my daughter cook and set about to adopt some of her ways. It is easier than ever and no more boring boiled vegetables! What a difference it makes roasting them. This is the best roasted vegetable recipe ever and credit goes to my daughter, Hannah, telling me just how she makes it, though I soon personalized it to fit our individual tastes. This is my variation of what I now call Hannah's Crust-less Vegetable/Sausage Pizza. It is a great substitute for pizza for those that need to eliminate gluten, and though I have many recipes that where gluten-free baking mix can be used, this is even more nutritious as it is simply roasted vegetables with sausage and garlic salt added and then topped with Mozzarella cheese melted on top. It has quickly become my husband's favorite dish, and he is not to be fooled with any sort of healthier version of anything! Of course enough sausage and cheese and it is not exactly a fat free dish!! You will not believe how easy it is to make! 2 large yellow summer squash diced (without seeds). May substitute other sorts of squash instead. 1 large onion sliced into strips. You may want to use more as they become deliciously caramelized! 1/2 large red or green pepper cut into bite sized pieces. May use yellow peppers.The more colorful the better! 2 large potatoes washed and sliced into bite sized slices. Leave skins on. Stir together in a big mixing bowl with about a tablespoon of olive oil, breaking apart onion slices and sprinkle on greased cookie sheet. Slice two and a half or three six inch fat sweet sausages into bite sized pieces and spread evenly on cookie sheet among the vegetables. Sprinkle entire pan with garlic salt. Bake in oven at 375 degrees until potatoes are tender and sausage pieces are brown. If you like food crispy, cook a little longer, and then pull out of oven and with a spatula move all vegetable and sausages to the center half of your cookie sheet being sure to cover any bare spots in pan and sprinkle mixture with shredded mozzarella cheese and place back in oven to heat until cheese is melted. If you double the recipe there is no need to pull vegetable mixture to the center of your cookie sheet first, as your cookie sheet will be densely filled. Cut into pieces like you would a pizza and serve. This is richer than pizza and so it doesn't take much to fill you up. Made as a single recipe it will easily serve two to three hungry people. Double and it will fill many more! This is easy to fix and will convince anyone that you are a gourmet cook!! My husband couldn't stop oohing and awing through dinner as he loved it that much! 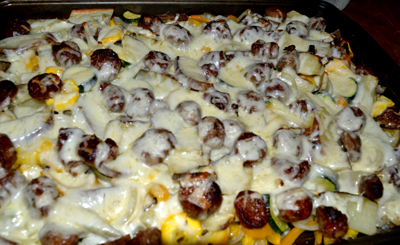 I am certain that other veggies can be added as long as there is sausage, potato, onions, peppers and cheese! The squash is delicious but acts more as a filler. I think cauliflower and broccoli would be good in it as well, and likely any other sorts of squash could be used as well. Bon appetite! !